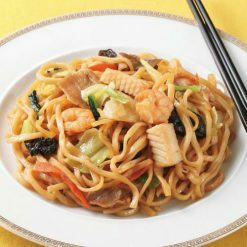 Chinese fried noodles with lots of hearty vegetables, pork and seafood. 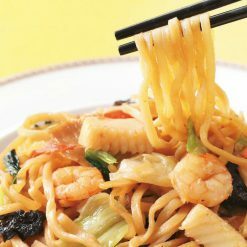 The oyster sauce gives the flat and chewy noodles the authentic flavor. Product totals 200g (one serving). 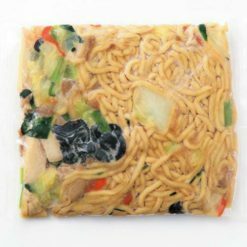 Our Shanghai fried noodles feature flat, chewy textured noodles, cooked in open fire with a fulfilling amount of fresh vegetables, squid, shrimp, and pork and seasoned with Oyster sauce so you can enjoy the well-rounded flavor and well-balanced nutrition. Already common and well-known among Asian cuisine savvy Westerners, oyster sauce is made from the water that was used for boiling oysters. Salted water is cooked down to concentrate the oyster flavor, then seasoned with sugar and another seasoning, then colored with caramel. It is most often used in Chinese cuisine, especially in the Cantonese cuisine. It adds the depth of flavor to a dish and brings out the taste of ingredients. To heat in a microwave oven, punture or cut some air holes into the frozen bag and heat in a microwave oven according to the following guidelines: 500W / 5 minutes 600W / 4 minutes and 30 seconds. When using a stove, immerse the frozen bag in a pot with boiling water and heat for about 8 minutes over medium heat. This product contains noodles (wheat flour, salt, powdered wheat protein, dried egg white), vegetables (cabbage, carrot, mustard spinach, bamboo shoots), squid, cloud ear, pork, shrimp, soy sauce, rice fermented seasoning, oyster extract, sesame oil, seasoning (salt, dextrin, yeast extract, spices, powdered vinegar), garlic powder, sugar, shrimp oil, powdered soy sauce, cooking oil (rapeseed oil) / chicory root extract, egg shell fcalcium, gardenia dye. This product is not suitable for anyone with allergies to egg, wheat, squid, shrimp, soy, pork or sesame. Origin of ingredients: cabbage (domestic). Prepared and packaged in Japan.